Air quality matters for human health, and many of the world’s urban areas suffer from high levels of contamination. One of the worst pollutants is PM2.5., which are microscopic particles less than 2.5 microns in diameter that lodge deep in the lungs, potentially leading to respiratory and cardiovascular disease in exposed populations. According to World Health Organization research on the environmental burden of disease, outdoor air pollution causes close to one million premature deaths worldwide each year, with particulate matter as one of the leading contributors. Fine particulates originate in large part from fossil fuels combustion and from agricultural and forest fires. How do we know how polluted the air is? In some cases, we know it when we breathe it —like when our throat and lungs get irritated. In other cases, we can see it, when visibility is reduced and the horizon is hazy. Air pollution concentrations can be monitored with ground-based instruments. 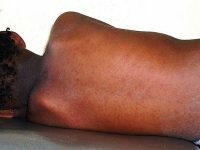 However, not all countries have the financial wherewithal and capacity to deploy ground-based instruments, and for some countries monitoring information is not available to the public, for example, through health advisories. For PM2.5, there are about 40 times more air quality monitors in North America and Western Europe than in the rest of the world combined. Each monitor costs on the order of $18,000 and requires something like $5,000 per year to operate. But there is another way to assess air pollution levels: from the top down, through satellites. Satellites have broad geographic coverage, provide regular observations (twice daily in some cases), and produce data that are generally available quickly and freely via the Internet. This is a major advantage over data from ground-based instruments. There are, however, some challenges associated with applying air quality measurements from satellites. Satellites, by definition, look down through the atmosphere and, as such, typically produce a column measurement of pollutants which does not necessarily reflect concentrations at ground level. They may also have difficulty measuring pollution on city scales. Yet these problems are not insurmountable. For PM2.5, satellites measure a property called Aerosol Optical Depth (AOD), which is an indication of light extinction that can be related to particle concentrations in the air. Aaron van Donkelaar and his colleagues at Dalhousie University have addressed the challenge of deriving surface concentrations from satellite AOD measurements. They tie the satellite measurements to ground-based PM2.5 concentrations and use NASA’s GEOS-Chem global chemical transport model to factor in weather and chemical conversion factors affecting surface concentrations. Building on this work, a team of researchers at Battelle Memorial Institute collaborated with the Center for International Earth Science Information Network at The Earth Institute to generate estimates of annual PM2.5 exposure for populations worldwide over a 10-year period, as derived from NASA MODIS and MISR data. This work was funded by the NASA Earth Science Division Applied Sciences Program. 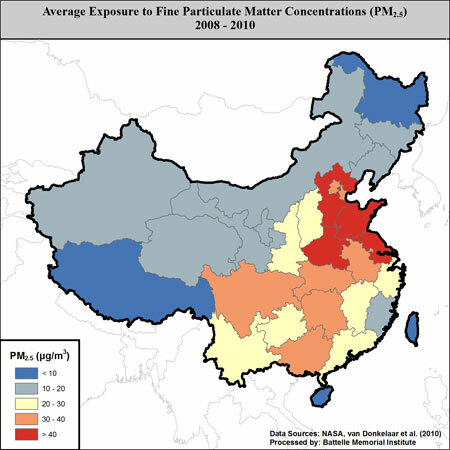 Battelle’s satellite-based results provide some insight on air pollution levels in China, a topic that has generated headlines recently. 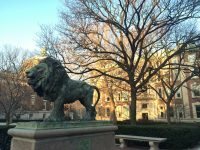 Because air pollution is influenced by the weather — for example, a stagnant air mass tends to hold any pollutants in place — it is best to look at several years of data to understand average pollution levels independent of weather patterns. 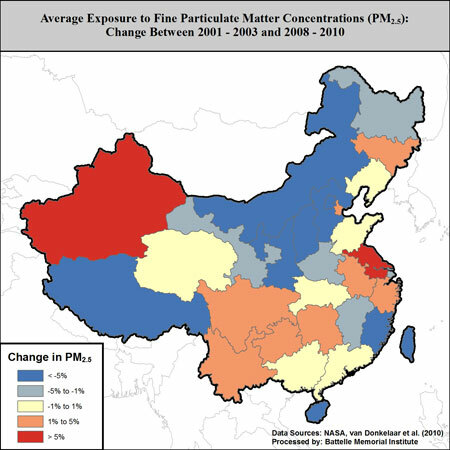 Figure 1 shows the average exposure to PM2.5 by province in China for the years 2008–2010. The data show that PM2.5 levels in China are above WHO guidelines for annual average PM2.5, (10 micro-grams per cubic meter (µg/m3)) by several-fold in many areas. Our methodology weights the results by population distribution such that concentrations in more densely populated areas are more heavily weighted than concentrations in areas with lower population density. 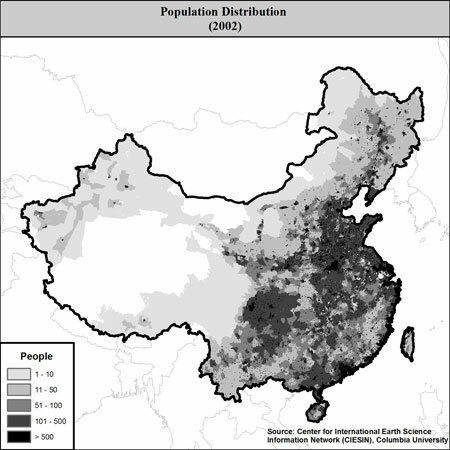 Figure 2 shows the population distribution of China according to CIESIN’s Global Rural Urban Mapping Project. In general we find that pollution concentrations are highest near population centers, since the industrial and transportation sectors are leading sources of emissions. Figure 3 shows the change in surface concentrations of PM2.5 in China over a 10-year period. Air pollution concentrations grew by more than 5% in Jiangsu and Xinjiang provinces, and though we are unable to pinpoint the exact reasons for this (most probably increases in population and industry), it can point policymakers to areas that may need greater attention. The question of how polluted the air is can best be answered with a combination of ground-based and satellite-based monitors. Studies such as this one, and recent data sharing by the Chinese government, bring us one step closer. After all, there’s more than one way to look at an air quality problem. This work was the basis of the Particulate Matter Indicator in the Yale-CIESIN 2012 Environmental Performance Index (EPI), and has generated considerable buzz in the media, including an Economist article and a posting by the Guardian Environment Network on China’s air quality, and a blog post by the New York Times on India’s air quality problems. Erica Zell and Stephanie Weber are from Battelle Memorial Institute and Alex de Sherbinin is a senior research associate at CIESIN. CIESIN deputy director Marc Levy and de Sherbinin serve as PI and co-PI, respectively, on the NASA ROSES Decisions grant NNX09AR72G that funded this work.